This PX pack test was done as a service to our dedicated readers. It’s not marketing hype or sales copy, but honest tests and field evaluations to help you find the perfect pack. Specialty storage: External knife and flashlight compartments, and a fast-access top load, padded video camera or spotting scope compartment that works well for e-call and decoy. H2O compatible: No, but side pockets for water bottles. Support system and fasteners: A padded back, wide hip belt, and contoured, padded shoulder straps for all day comfort. Unique features: The fold out rifle/bow boot worked great, and makes a handy seat cushion on wet ground. 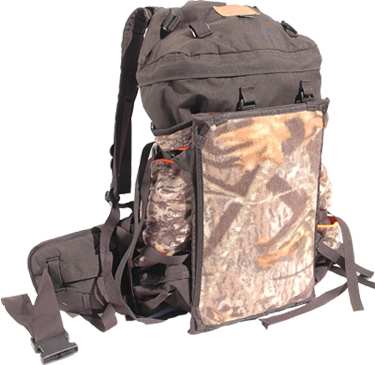 The addition of Crooked Horn’s new instant access seat and shooting stick holder makes this one of the most predator hunter friendly packs on the market. Predator carrying capable: With two large main compartments, gear could be carried in one and a pelt in the other. Overall impression: This pack has been a standard in the western hunter’s arsenal for over 15 years with only minor changes. It works well for many applications, with quality zippers, extended pull cords throughout and unique, easy-to-operate nylon adjustable buckles. One suggestion would be to line the pack with a light colored material instead of black for better internal visibility. 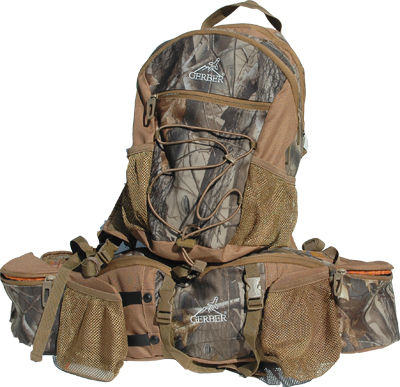 Specialty storage: This pack is perfect for organizing predator calls with a dedicated fold out call case, and a main compartment designed to hold an e-call and decoy. H20 compatible: No bladder or dedicated space for a water bottle. Support system and fasteners: Excellent waist belt with single shoulder strap. It is a simple system once you get used to it, but be sure to watch the DVD for instructions. Unique features: A padded seat that serves as a sitting- or prone-shooting rest in a pinch. Dedicated call carrying areas. 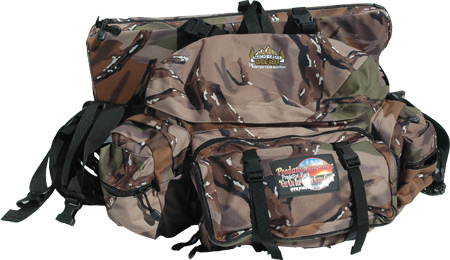 Best described as an ultra-large fanny design with a single cross-shoulder strap to distribute the weight. Predator carrying capable: An excellent pouch is included to transport predators while protecting the pack and the hunter’s clothing from blood. 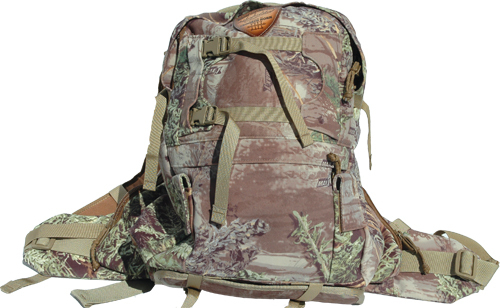 Overall impression: A unique, well-made pack designed from the ground up with predator hunting in mind. Specialty storage: This pack could be improved with smaller storage compartments on the outside. Support system and fasteners: Good design with a semi rigid frame for heavier loads. Waist belt and shoulder straps were adequate, but could use tweaking. Unique features: The small red LED light attached to the inside of the smaller compartment is perfect for finding gear at night. Activated manually or with an integrated switch that turns it on when the pack is opened. Predator carrying capable: Large enough to store a coyote carcass inside the main compartment. For hunters not wishing to get the main compartment bloody, just the frame and lower pack portion give plenty of room to strap a coyote to the exposed portion of the frame. Overall impression: This pack has been around a long time, and for good reason, it is functional. For the hunter who likes to trek off on foot making one stand after another carrying a lunch, some survival gear and possibly a coyote or two back to the pick up, it would not be oversize. While not as advanced as some of the other packs in this test, it has been proven over the years. The harness system needs thicker straps and waist belt, and it should be made out of quieter material. Capacity: Expandable from 1,470 to 3,515 cubic inches. Specialty storage: Very unique expandable design ideal for carrying out a whole coyote. The expandable section is blood proof and washable with a drain hole in the bottom for easy hose washout. H2O compatible: Comes with a Hydrastorm bladder, which was the best hydration bladder system tested. 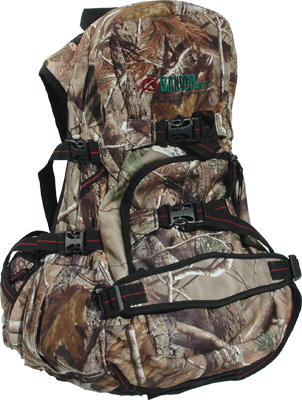 Support system and fasteners: Well padded shoulder straps with non-slip Hawk-Tex coating to keep rifle slings in place. Padded and vented back support to dissipate moisture. 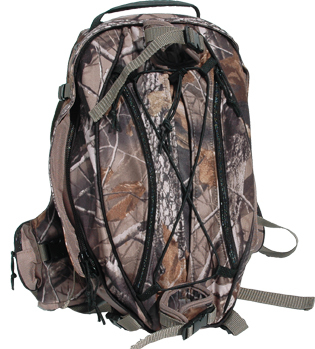 Specialty storage: Several smaller pockets for GPS, camera, and predator calls. This pack features the Buddy Lok system for specialty storage customization with a host of aftermarket products. Support systems and fasteners: The support system is fine for moderate loads but could use extra back support through aluminum or plastic stays (supports) for heavy loads. Unique features: Integral lighting system, with one light on the shoulder strap, the other inside the pack. These are very helpful for the night hunter. The light inside the pack is the same as on the Dwight Schuh model, which can be turned on manually or set to turn on when the pack is opened. Overall impression: This pack incorporates some great ideas, but the quality level could be increased. The pack was not overly water resistant, and since it was made from rubberized material with rubberized zippers it is stiff and noisy. The light system is a fantastic idea, but the quality of the shoulder mounted light could be improved. Pockets/compartments: One main compartment with top and bottom access, and a front pocket. Specialty storage: Add on accessories from Kifaru and the load hauler platform. H2O compatible: Hydration bladder compatible, but does not come with a bladder. Support system and fasteners: Probably the finest feature in this pack – the support system is designed for carrying heavy loads. 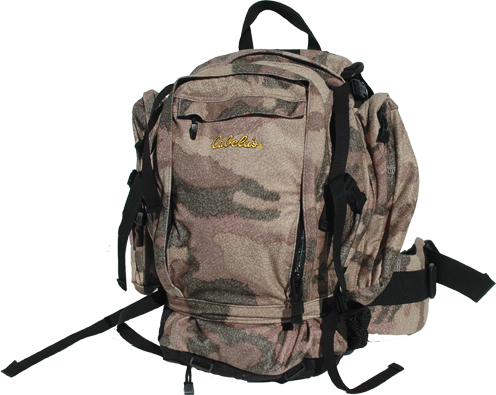 Of all the packs tested, this has the best rugged construction and excellent back support. Unique features: The reversible camo to blaze orange outside cover can be removed and washed. The load hauler platform, which works well for carrying large loads worked even better as a back rest/seat when making a stand. If you set up where there is not a convenient support to lean on, the load hauler can be dropped down and works as a comfortable chair keeping your bottom dry while providing plenty of back support. 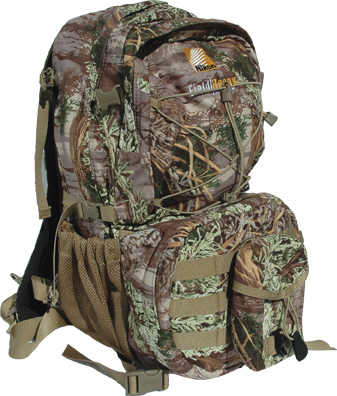 Predator carrying capable: This pack has a unique load hauler shelf, which would work well for strapping down a coyote. It would keep the blood away from the contents inside. Overall impression: This pack will last for years because it’s strong and well made. Very “mountaineering” in design, perhaps overkill for the average predator hunter, but like other packs in its class would work extremely well for everything from big game to predator hunting. Pockets/compartments: This two-part daypack/fanny pack has two large compartments in the daypack portion and one large compartment in the fanny pack. Numerous smaller pockets and pouches are strategically placed throughout. Specialty storage: The side mounted “slideable” pouches worked great for smaller items like GPS, camera and coyote calls. H2O compatible: Comes with Gerber’s own semi-rigid molded bladder. Support system and fastener: With the semi-rigid water bladder in place the pack is more like an internal frame pack. With it removed, it is more comfortable, but only with lighter loads. Unique features: While this pack has lots of features from oversized zipper pulls to adjustable pockets on the waist belt, our favorite was the simplest – light gray lining inside all the pockets. It is amazing how much easier it is to see the contents inside. Predator carrying capable: Neither the top compartment nor the fanny pack are large enough to transport a coyote carcass. Overall impression: The overall design of the pack is good with lots of features and quality manufacturing techniques. However, the back support system, waist belt and shoulder straps need a more ergonomic shape and more rigid, thicker padding. For carrying relatively light loads, it is fine, but for heavier items, it needs improvement. Specialty storage: Buddy Lok system on the waist belt, and the bow/rifle carrier allows for complete customization. 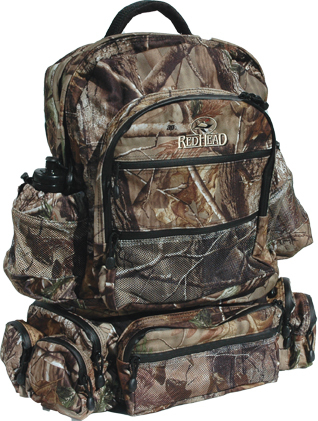 Unique features: The removable smaller pack is ideal for short jaunts away from the truck when hunters want to just carry the bare essentials into a stand. Overall impression: This pack is designed to securely hold a gun or bow for hands free climbing over rugged ground and up steep mountains. It is actually a two part pack with a small accessory section to disengage and be carried with its own straps. This is nice for hunters who keep all their calls in this portion and want to head afield for just one stand minimizing their burden. Plenty of pockets as well as unique features such as dedicated lashing points for tripods and/or shooting sticks. Double layer bathtub style bottom for water protection, and constructed of CT450 material which remains waterproof as well as flexible and quiet under cold conditions. Specialty storage: The gun carrying system was the best tested. It carries the rifle (even a large predator rifle), completely protected and next to the center of the back, and readily accessible while wearing the pack. H2O compatible: Yes, but does not include a bladder. Support system and fasteners: One of the most comfortable support systems tested. Extremely well designed, comfortable and very tough. 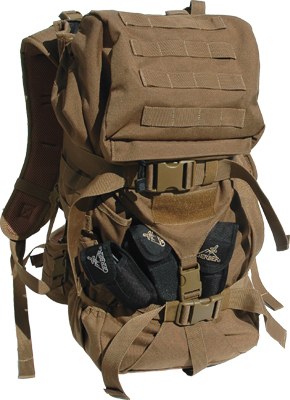 Unique features: This pack can be compressed to a regular sized daypack or expanded for large “hauling out” capabilities. We also liked the full length side zipper, perfect for finding what you need at the bottom of the pack without removing everything from the top. Predator carrying capable: Yes, inside the main compartment. Overall impressions: This pack might be overkill for just predator hunting, but for a hunter looking for one pack to do everything from elk to fox hunting, it would make a great choice. Specialty storage: Good use of the waist belt for additional storage. Nice compartments for calls, GPS or camera. The bow and rifle carrier is easy to use and secure. Support system and fastener: Large padded straps with non-slip texturing, waist belt is wide and comfortable, molded rigid foam for back support. They could beef up the strap system and overall stitching up for extra strength and durability. 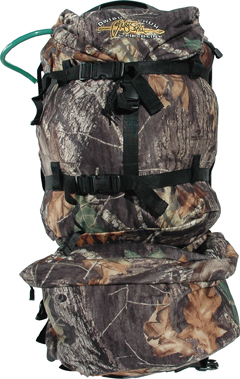 Unique features: The convenient gun/bow carrying straps were easy to use and secure without adding extra bulk. Predator carrying capable: Yes for hides, but a snug fit for a carcass. 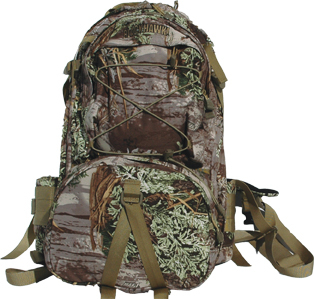 Overall impression: A good pack that can serve double duty between the whitetail woods and the predator stand. Features such as water bottle pouches or a hydration bladder, and waterproof pockets for electronics would make it more useful. Color: Realtree Advantage Max 1 HD? Specialty storage: Lots of specialty storage designed primarily around hunter’s optics. Pockets for digital cameras, binocular, rangefinders and a spotting scope are included. 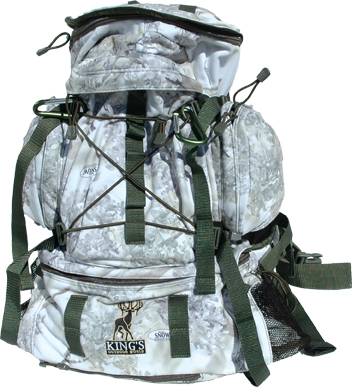 Support system and fastener: Well built padded straps with non-slip Hawk-Tex coating to keep a rifle sling in place, padded semi-rigid back for good support with moderate air flow. Predator carrying capable: No carcasses, but could carry a hide. Overall impression: This is a well-built pack made by two very good companies; Blackhawk and Nikon. If you carry a lot of electronics and/optics into the field with you this would be a great choice. Specialty storage: An excellent top load design that would work great for spotting scopes, video equipment or e-calls. H2O compatible: This pack is bladder compatible and has two side holders for water bottles. Support system and fasteners: A good support system with lumbar padding and a wide waist belt, one of the more comfortable packs tested with little adjustment required. Unique features: A rubberized bottom to keep contents dry from ground moisture as well as a waterproof pack cover, which was easy to slip on in case of a storm. Predator carrying capable: Large enough to store a coyote carcass inside, but it would use all of the internal space. Overall impression: A high quality pack rugged enough to withstand lots of abuse. The pocket layout and small compartment design is very good, the fleece material is quiet and the many external tie down points come in handy. Being able to convert this pack from two main compartments to one is useful for packing out carcasses. This was by and far the best weather resistant design. Constructed with waterproof material with storm flap covered zippers and a zip out, self-contained rain fly, this pack is ideal for wet weather predator hunting anywhere. Specialty storage: This pack defines “specialty storage” as the inside of the pack is extremely well laid out with a place for everything. H2O compatible: Yes, but bladder not included. Unique features: A well laid out internal pocket structure for easy finding of gear, and removable gear bag for predator calls when making a stand. The entire inside of the pack is light tan making finding gear easier. Overall impression: We really liked the side storage compartments on the waist belt for items such as calls and rangefinders. The closed cell foam padded bathtub style bottom will protect fragile gear like spotting scopes, and increase weather resistance. This is a great pack for a hunter who likes everything in its place. There is a spot for every call and accessory you may carry afield.